Build and share a role elevator pitch. We tackled this idea in our ebook, The Sales Hiring Hourglass, but I want to expand on the topic a bit. 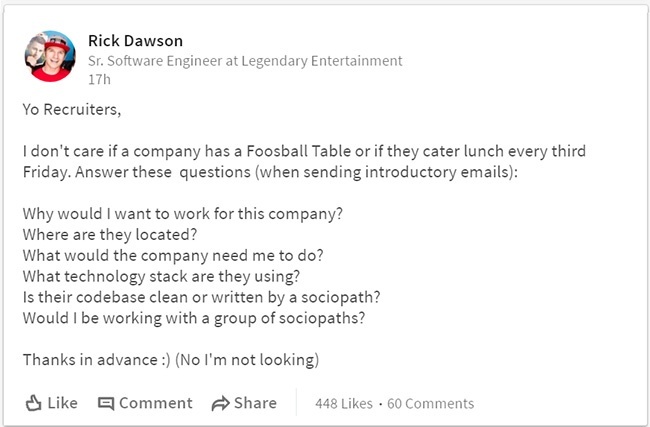 I’m sure you know the hiring profile you’re looking for. Most leaders have a solid handle on the behaviors and competencies that make for an ideal candidate. But far too few have spent much time thinking about their role from the candidate perspective. Have you documented, however informally, your role elevator pitch? Approach this as you would creating messaging against a competitor. You don’t need flowing prose or Madison Avenue ad copy. You do need a few bullets on why this role matters and why your company makes for an amazing opportunity. Imagine three overlapping circles. 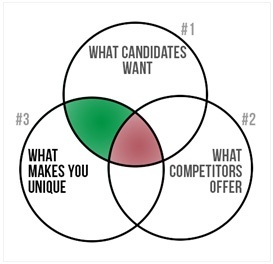 Circle #1 is what candidates want. Circle #2 is what competitors offer. Circle # 3 is what your company offers. The overlap between all three circles (red) are points of non-differentiation. This is what every employer offers, or at least claims to offer. Focus on the overlap between Circles #1 and #3 (green). The core of your role elevator pitch should be the intersection of what candidates are looking for and what you uniquely bring to the table. The role elevator pitch is the basis for your job description, outreach InMails, and recruiter messaging. It has to pop. I want to share a few examples with you. To simplify things, I’ve built a sort of Mad Libs™ for Hiring to get you started. I found a few job descriptions that I thought were excellent. I worked backwards to mock up what their role elevator pitch might look like. Join us and lay the foundation for an amazing and lucrative career. Join us and take a seat on a rocket ship while you exceed $275K on plan. Join us and put your talents to use creating and scaling formal and informal learning and training programs. These examples should provide you with a starting point. You don’t have to be Ernest Hemingway or Toni Morrison to pull this off. But you do need to flip your mindset from what traits do I need to what aspirations can I speak to. I hope you’ll take a look at whole the ebook as well.